Here is the “other” Roman way with salt cod: baccalà in guazzetto, simmered in tomato sauce. It may not be quite as famous as Rome’s iconic battered and fried salt cod filets called filetti di baccalà but it’s just delicious, although in a very different way. 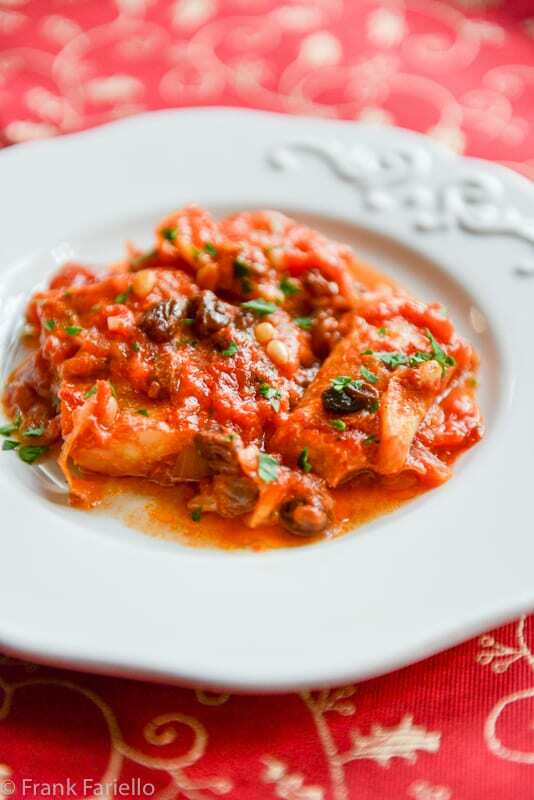 Simmering salt cod in tomato sauce—”in umido” as it’s usually called—is common in Italian cookery, and we’ve already featured a typical example of the style as they make it in Naples. But this Roman version stands out for its addition of raisins and pine nuts, which lends a slight sweetness to the dish. Baccalà in guazzetto is often found on Christmas Eve tables, but—if you’re a baccalà lover like me—it’s too good to limit to just one evening a year. In a large skillet or sauté pan, sauté the onions gently in olive oil until they are quite soft and translucent, seasoning the onions with salt and pepper as you go. Add the canned tomatoes, crushing them with your hands as you add them to the pan. (Or pass them through a food mill if you don’t like getting your hands messy…) Let the tomato simmer for 10-15 minutes, until the tomatoes have reduced down to a saucy consistency. At this point, add the baccalà pieces, along with the raisins and pine nuts. Season with salt and pepper. Turn the pieces in the sauce so they are covered all over. Add a bit of water to loosen the sauce if needed. Cover, leaving the lid slightly ajar, for a good 20-30 minutes, and simmer gently until the baccalà has cooked through and the sauce has thickened nicely. Check from time to time, and things are drying out, add a tad more water. Before serving, taste and adjust for seasoning. Serve still hot, topped if you like with some minced parsley for color. Soaking times for dried salt cod vary wildly. It is sometimes sold still quite fresh and needs really only a few hours soaking. (This kind tends to be quite expensive, but it’s very good.) Mostly, however, the cod is nearly bone-dry. This kind needs a much longer soak, up to 24 and even 48 hours to soften up. Inspect how dried out the fish looks and use your judgment. Or even better, if you live near an old-school Italian neighborhood, you may be able to find fish stores selling pre-soaked baccalà, which makes this a really quick dish to make. Most dried salt cod these days is sold as skinless, boneless filets, but if not you’ll obviously need to skin the fish and pick out any stray bones after it’s been soaked. In fact, do check for bones anyway. It’s not unusual to find a stray bone or two even in supposedly boneless filets. In some recipes, you flour and fry the baccalà separately before adding it to the sauce. That sounds nice—and the frying no doubt adds an extra layer of flavor—but with its zesty sauce this dish isn’t short on flavor anyway. And this simpler version is the one I’ve found in the more traditional sources, including Ada Boni’s iconic Talismano and Livio Javanotti’s entertaining La cucina romana e del Lazio. Any leftover baccalà in guazzetto makes a nice condimento for pasta. Just reheat the dish gently, breaking up the filets of fish into bite-sized pieces. Add slightly undercooked pasta, along with a ladleful of the pasta cooking water, and let it simmer for just a minute in the sauce to absorb the flavors. Serve right away. No cheese, mi raccommando! Add the canned tomatoes, crushing them with your hands as you add them to the pan. (Or pass them through a food mill if you don't like getting your hands messy...) Let the tomato simmer for 10-15 minutes, until the tomatoes have reduced down to a saucy consistency. Add the baccalà pieces, along with the raisins and pine nuts. Season with salt and pepper. Turning the pieces in the sauce so they are covered all over, adding a bit of water to loosen the sauce if needed. Cover, leaving the lid slightly ajar, for a good 20-30 minutes, and simmer gently until the baccalà is cooked through and the sauce has thickened nicely. Check from time to time, and things are drying out, add a tad more water. Before serving, taste and adjust for seasoning. Frank – if we can find the salt cod (thanks, Mimi, for the Whole Foods tip! ), we might make this for Christmas Eve. What would you suggest for the rest of the menu? It will just be Mark and me. Hmmm… I’ve been debating about Christmas Eve dinner, too. We always have spaghetti alle vongole as a first course. For an antipasto, perhaps a seafood salad? Or a shrimp cocktail, Italian style, which I featured a few months back. Or maybe a sautè di cozze? And then there’s the insalata di rinforzo, which at least in Neapolitan families can’t be missing from the table. I can always find it in San Francisco. I just received mail order dried salt cod from Shetland, triggered by this precise recipe. Google should find it, if you need some. Thanks for the tip, Robert! I have never seen salt cod being sold here on the west coast. Your recipe as always looks good and I would like to try it. Happy Holidays! Thanks, Gerlinde! As mentioned in some of the other comments, besides Italian delis, if you have Spanish or Portuguese stores nearby, they may carry “bacalao”. Otherwise, there’s always online—amazon.com includes several sellers. Happy holidays to you, too! Frank, I couldn’t help wondering whether the raisins and pine nuts were more a Sicilian touch than a Roman, but I defer to you on tracing the origins of Italian food. In either event, it sounds delicious and I love your “mi raccomando” at the end. I’m not very familiar with Sicilian cookery, so your comment got me curious. A little poking around my cookbook collection and internet was illuminating. Baccalà alla siciliana generally involves potatoes, olives, capers, and usually (but not always) tomato sauce. And yes, some recipes also call for raisins and pine nuts. Sounds pretty tasty, actually. Will have to try that soon, too. Oh, how I love baccalà, in every different preparation, and that sounds particularly delicious. But, knowing how depleted the cod population is, I feel so guilty using it. Nevertheless, I’m headed to Rome next month and plan to eat it with abandon if the chance arises. Nothing counts on vacation, right? Do you ever soak your baccala in milk? Wonderful recipe Frank, thank you once again and I appreciate the final “mi raccommando”. I’ve soaked fresh cod in milk, but not baccalà. I wonder if it wouldn’t spoil over such a long soaking time? Thanks for stopping by, Paula! There are similar recipes with fish and raising here, but this one uses salted cod (which we LOVE) and is so simple as well! Of course, we’ll be trying this one out really (REALLY) soon! Thanks for your kind comment, guys! Your receipe looks delicious. Adding raisins and pine nuts is different than my way of cooking bacala, but I like the variation. I use leeks instead of a onions and serve it with ceci and polenta for a Lenten meal before the holidays. I love the flavor of leeks—I’ll have to try your way of braising baccalà soon. And I love the idea of using it to fill ravioli! … I might have finally found reliable sources of baccalà… the Portuguese community here in London! — I would love to make it for Christmass (frittelle di b.) and to try this version of yours. Indeed, the Portuguese do love their “bacalao” as they call it. Thank you and God Bless ! Happy holidays ! Thanks so much! There are so many different ways to prepare cod—and I don’t think I’ve come across a recipe I didn’t like yet. Happy Holidays to you, too! Salt cod is SO good, isn’t it? This is a nice way of making it — I’m mad for any and all tomato sauces to begin with, and I’ll bet the flavor of the tomatoes and the cod is wonderful. Like the touch of raisins and pine nuts, too. Not authentic, I’m sure, but I wonder how some chopped up dates wold work in this sauce? Probably shouldn’t mess with this — it looks wonderful as is. Thanks! Interesting thought, John. I might want to try throwing in some chopped dates, say instead of the raisins, and see what that produces. I kind of like the sound of it. Oh I love salt cod. Of all places I found it once at Whole Foods, not where I live because there isn’t one here, and I had so much fun making a few different recipes with it. I would so love to try this. The raisins are a fascinating inclusion! Hope you like it, Mimi. The raisins do add a nice touch!